Personalized calendars with photos have been gaining major popularity during last few years. It comes as no surprise – you will hardly find a better one-of-a-kind present for your relatives, friends and colleagues. Photo Calendar Creator will help you make a photo calendar on your PC any time you want. This calendar creator software is easy to work with even for newbies thanks to its user-friendly interface. What’s more, the program comes with dozens of ready-made yet customizable calendar templates. Just choose one and add your own photos to it or design every page to your taste. Want to give it a go? Then follow the simple instruction below. Download the installation file from the official website. The procedure will be completed within a few moments. In the startup window, choose the New Project option and select from wall, desk, and pocket calendar types. Also, you can create a planner for a week, a month, or a whole year. Horizontal and vertical calendar templates are for your choice as well. Who said that you have to make a standard calendar starting with January? There is absolutely no need in it! Want your year to begin in March? No problem – Photo Calendar Creator gives you this possibility. Just select the necessary month in the drop-down list. There is a large library of gorgeous calendar templates in the program but you are not limited to them. Change the month grid from a classic style to table or decorative ones. Feel free to choose a font for the month, weekdays and weekends names. Insert your own photos easily and add an outline or shadow to them. Replace, resize and move your images as you like. Type in your own text and adjust its color and size with just a couple of mouse clicks. When you are totally happy with your calendar look, you can print it out. Don’t have a printer at home? No worries – you can save your calendar as an image, send it to an USB stick and take it to a print shop. What’s more, you can use or edit the project later. For example, you might need to replace your photos, add important events or holidays, or delete some text captions. 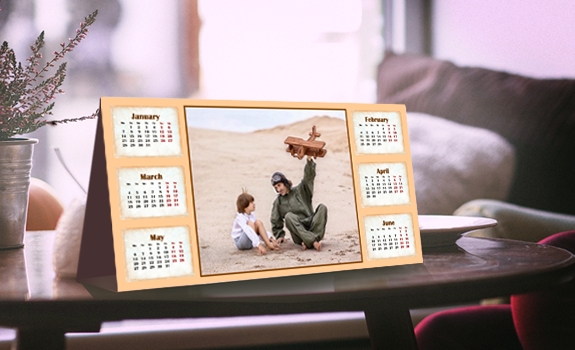 Desk calendars with your treasured family photos to have it in your office and many other types. Unleash your artistic talents and put them to the test!